Robots are gaining adoption across a wide range of industries. Recently, the Smithsonian Institution has started to use Softbank Robotics’ Pepper robot to add value to the the visitor museum experience. 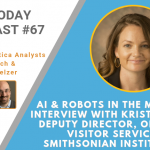 In this podcast, Cognilytica analysts Ronald Schmelzer and Kathleen Walch interview Kristi Delich, Deputy Director, Office of Visitor Services, Smithsonian Institution on how Pepper is being used at the museum, potential future uses, and observations from how the general public interacts with a robot in a museum environment. 87 episodes available. A new episode about every 7 days averaging 21 mins duration .